With the exponential growth of data being generated around the world and the increase of applications that can take advantage of real time massive data processing for high performance, data analytics, business intelligence, national security and Internet of Things™ applications, the market demands faster and more efficient interconnect solutions. 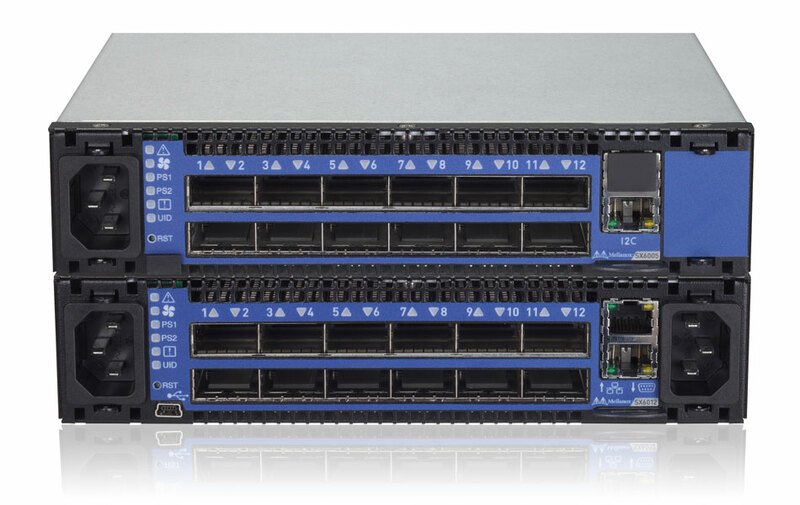 The SX6000 switch systems provide the highest-performing fabric solutions in a 1RU form factor by delivering 4Tb/s of non-blocking bandwidth to High-Performance Computing and Enterprise Data Centers, with 200ns port-to-port latency. Built with Mellanox’s latest SwitchX InfiniBand switch device, these switches provide up to 56Gb/s full bidirectional bandwidth per port. These stand-alone switches are an ideal choice for top-of-rack leaf connectivity or for building small to medium sized clusters. They are designed to carry converged LAN and SAN traffic with the combination of assured bandwidth and granular Quality of Service (QoS). The integrated InfiniBand routing functionality enables design and deployment of larger scale InfiniBand fabrics with no limitations. Its low-latency enables fast communications within and across the data center. InfiniBand routing enables also fabric isolation between different cluster segments (compute/network and storage).